We often discuss the power of video games for change, for education, for enlightenment. How fitting then that the New York Post, a bastion of sophisticated and incisive political editorial, has created a video game as commentary on the Democratic race for Presidential nominee. Hate Hillary? 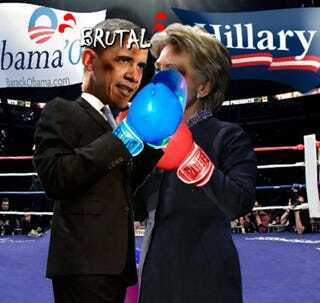 Want to beat down Barack? Whichever your pleasure, this NYP game lets you play as your candidate of choice and pound the opposition's face in by clicking your mouse a million times until you win. And yeah, that's pretty much the extent of it. Ian Bogost is rolling in his grave. Oh, wait, he's not dead yet, though I'll bet this game will make him want to drive rusty nails into his eyeballs.